Not to be confused by Chloe 2008, the young remake of 1975. These two fragrances smell nothing alike. Though they share the same name and are both essentially florals, they are leagues apart. In Bottle: A heady, lush tuberose with jasmine and lily of the valley. It’s light, powdery and much more mature than Chloe 2008. Applied: The initial fragrance is a light, lilting lily of the valley scent that’s quick to dissipate as a big lush tuberose and its friend jasmine head into the scene. Chloe 1975 is all about the white florals and no white floral is louder and more recognizable than the charismatic tuberose. Slightly sweet, and dusted in powder the tuberose is what dominates the heart of this fragrance but does let a nice classic rose and its jasmine friend in now and then. Chloe 1975 is a bit musky too, she’s a pretty floral but the tuberose and ambery treatment give her a little bit of sensuality. In the dry down, the tuberose is still very prominent as it mixes with smooth white woods and amber. Chloe 1975 was released in the powerhouse era and it’s strength is not to be undermined. Go light on this stuff if you have it or you will be smelled from quite a distance. Extra: Chloe is a fashion house founded in 1952. Today, they still deal with fashion but have also added accessories such as handbags and sunglasses to their répertoire. Classic Chloe, as Chloe 1975 is often called, was replaced in 2008 by a new fragrance of the same name. You can find Classic Chloe at discounters for the time being. 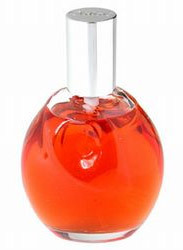 Design: Designed by Joe Messina, the bottle for Chloe 1975 is supposed to be reminiscent of a calla lily. A lot of people who see the bottle, however, associate it to looking more like a heart. Not Vera Wang Princess heart either. Think anatomical heart. Notes: Lily of the valley, honeysuckle, orange flower, ylang-ylang, hyacinth, jasmine, rose, narcissus, carnation, tuberose, sandalwood, amber, oakmoss. I vastly prefer Chloe 1975’s fragrance to Chloe 2008. But I prefer Chloe 2008’s packaging. Reviewed in This Post: Chloe, ~1980, Eau de Parfum. This entry was posted in chloe, floral, Reviews By House and tagged 1975, amber, chloe, classic, fragrance, jasmine, lily, perfume, rose, scent, tuberose. Bookmark the permalink.